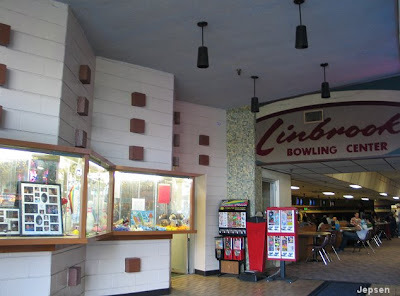 The 50th anniversary of the Linbrook Bowl will serve as the backdrop for the Anaheim Historical Society's annual dinner, June 13, 6:30pm. Jane Newell will give a presentation on "Life in Anaheim in 1958," and everyone is encouraged (but not required) to attend wearing period attire. The dinner will be held in the Linbrook Bowl Banquet Room, 201 S. Brookhurst. Afterward, bowling will be offered at a special discount price. To register for the dinner, send $15 per person to the Anaheim Historical Society, P.O. Box 927, Anaheim, CA 92815. When I started photographing Orange County's Googie architecture in the 1990s, the Linbrook was one of the first places I visited. Today, it's one of the few local examples of Googie still standing. The Pacific Coast Achaeological Society will hold a field trip on June 14 to see prehistoric rock art (petroglyphs) along the Ortega Highway.The group will meet at 9am in the parking lot of JSerra High School on Junipero Serra Rd, in San Juan Capistrano. Bring a packed lunch, hiking shoes, sunscreen, hat, and $5 for a Forest Service pass. After the petroglyph tour, Steve O’Neil will lead an optional afternoon tour of Mission San Juan Capistrano to see early Native American paintings. (Regular Mission admission costs apply.) To sign up, contact Steve via email or at (949) 548-7934 or . For contact on the day of the field trip, call (714) 290-1845. Speaking of pre-historic artifacts,... The fun continues at Bolsa Chica, in Huntington Beach. Some Juaneño and Tognva Indians are protesting "the developer's disrespect toward their ancestors and lack of transparency about archeological findings." Read all about it in the Register. We had two crabby, mostly off-topic posts here from completely opposing points of view. I'm deleting *both* (equal time) because they really didn't suit the tone of discussion here. I appreciate your participation and enthusiasm, but let's try to keep it friendly, folks. (Even when we touch on sensitive subjects like Fountain Valley.) Thanks. I have lunch and bowl a few games there every time I'm visiting Disneyland. I wish I could attend the 50th anniversary event...Jane Newell's presentation will be fascinating I'm sure. Just so everyone knows, my comment wasn't "crabby" but rather the historical truth--and if you don't believe me, go talk to the folks at the Orange County Mexican American Historical Society!